"What's an immortal Neanderthal to do?" The gods grant a Neanderthal immortality from his own time and home. Left on an island beyond the sunrise, the caveman seeks his own life of adventure. The Adventures of Cletus has not been tagged yet. Help others find The Adventures of Cletus by tagging it! The Adventures of Cletus has not been reviewed yet. 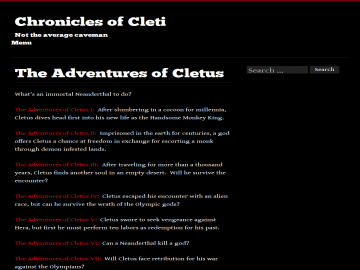 The Adventures of Cletus has not been recommended yet.